It can stop freezing here at night anytime now! There is something called the frost free date, when tracked temperatures are historically shown to stay above freezing all day and night. The USDA maps this, and in this part of the world the frost free date gets earlier each time the map is redrawn. It is a basic indicator of climate change..the temperature sensitive plants can go in the ground earlier and earlier in the calendar year. Here, the official date has been mid-May. 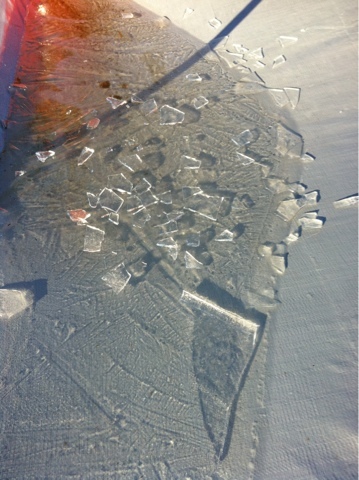 We had skim ice last night on every water receptacle on the farm. This is the tarp on a pen roof where a little water had collected from rain. There are hundreds of chicks of various ages in pens on the field. There are vegetables that need to go in the ground. There are birds sitting on nests, keeping eggs warm so they can hatch. And there are flowering trees, bulbs, shrubs, flowers just waiting for the temperature to warm up so they can burst open. From today onward night time temperatures are well above freezing. We will watch and cover/protect tender things and hope the frost free date has moved up to April here. We will push the limits of course, because that is what farmers do..